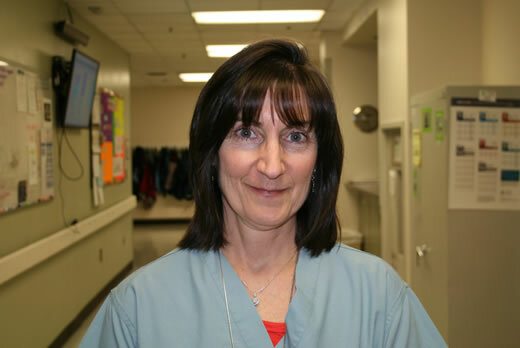 In celebration of National Nurses Week, Emory Saint Joseph's introduces nurse Coleen Wells. Since I moved here from New York in November 2003. First, on 6 West for two-plus years, followed by ARU (admission and recovery unit) for about the same time. I have the honor of working with some of the best nurses at Emory Saint Joseph's, who are my family. I found my true love of cardiology working in the Electrophysiology Lab, where I have been for seven years now. Last year, I obtained my certification as a Registered Cardiovascular Electrophysiology Specialist. I knew as a young girl that I wanted to be a nurse. I watched my beloved grandmother die from COPD and decided I wanted to help sick people. My husband and I never had children, so I believe my maternal instincts are satisfied, caring for my patients. I take pride in the fact that I can make my patients more at ease during stressful times for them. Having gone through some difficult diagnoses with my family, I truly empathize with my patients. Have you received any special awards? In May 2013, I was awarded the "Outstanding Patient Advocate" by my co-workers.